Isn’t it interesting how God will use questions to provide insight or vision for His people? Clearly, God asks questions throughout the Bible not unlike the question He asked Ezekiel [“Can these bones live?”]. His questions are designed to take us to the level of thought needed for the context we are in. 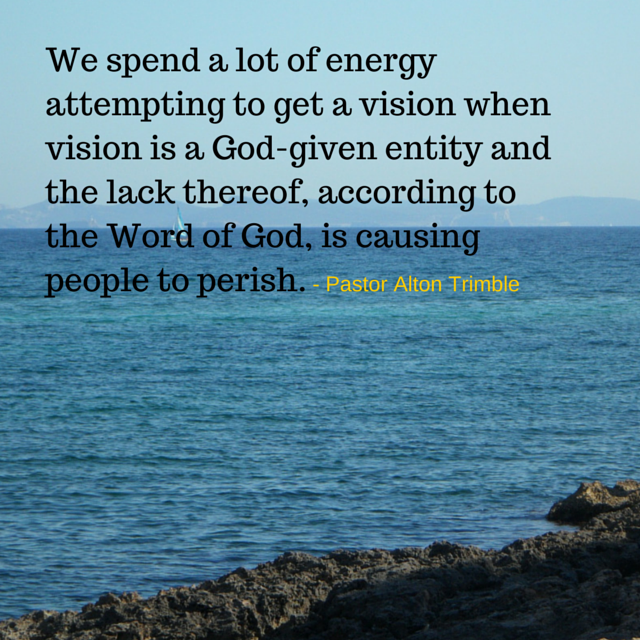 Albert Einstein once said, “No problem can be solved from the same level of consciousness that created it.” We spend a lot of energy attempting to get a vision when vision is a God-given entity and the lack thereof, according to the Word of God, is causing people to perish. We cannot avoid the question that God will ask us concerning our present or our future; our silence speaks loudly to God. Thank God Hebrews 12:1 assures us of the witnesses to the fact that God can and will provide vision to overcome any challenge confronting a believer. Hebrews 12:1 – Therefore we also, since we are surrounded by so great a cloud of witnesses, let us lay aside every weight, and the sin which so easily ensnares us, and let us run with endurance the race that is set before us. So what do we do to hear from God and receive vision? II Chronicles 7:14 is a roadmap to where we want to go. II Chronicles 7:14 – If My people who are called by My name will humble themselves, and pray and seek My face, and turn from their wicked ways, then I will hear from heaven, and will forgive their sin and heal their land . 2. Prayer is a must. 3. Pursuit of God is critical. Allow II Chronicles 7:14 to be your meditation today and take to heart that part you need to incorporate most. Thank You Lord for calling me, thank You Lord for humbling me. I will pray and seek Your face always while turning away from my wicked ways. I await my healing and continued breakthrough as I give You all the glory, all the honor, and praise. Great word today and everyday P.T., I feel so blessed to be a part of the Glory family. Thank you so much for all that you do for God, G.C.F.I, and us. We are blessed to have you and your family, Donald. Thank you P.T. for your awesome leadership and teaching of God’s word. We praise you God almighty for using this wonderful family ago baptized believers at GCFI. We hunger and thirst for more of you and the vision you have given us to Win, Disciple and Send. Thank you God for humbling me and being patient with me. As I have often times preached, “There is a destination for your destiny for you were appointed by God to get there if you trust Him.” Continue to seek the face of Christ & not his hand & watch where He leads you. You shall be amazed! LORD, thank you for being my shepherd and leading and guiding me! I’m lost without YOU. Speak LORD, your servant hears. Thank you God for your love, word, wisdom, knowledge, and vision. Yes, I will trust the Lord with all my heart! Thank you Lord for breakthroughs for all that call upon the name of Jesus! Praying for increase of your harvest Jesus. In you mighty name .